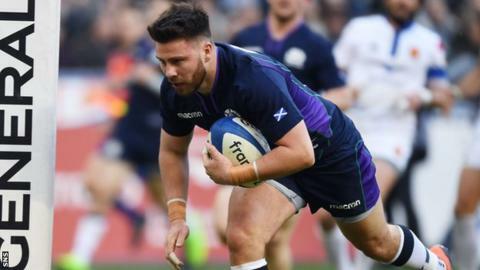 Scotland have "not really fired a shot" in the Six Nations but are resolved to make amends with victory over Wales, says scrum-half Ali Price. The Scots followed up a patchy performance in victory over Italy on the opening day with a disappointing home loss to Ireland. A desperately poor display saw them comfortably beaten by France in Paris last time out and Price concedes the campaign has been underwhelming. "We've not really clicked," Price said. "It's disappointing and the boys were down after that France game. We've had a couple of reviews this week and it's important not to dwell. "We've not really fired a shot in this tournament whether it be in attack or defence. It's just down to little bits of accuracy. "It shouldn't take until the fourth game to get that, but maybe we'll click against Wales and put in a good performance." After a stirring victory over England which saw them go three wins from three, Warren Gatland's Welsh side are coming to Murrayfield looking to clear the fourth hurdle on their way to a potential Grand Slam in the head coach's final season in charge. Price says Wales are "a good side who are on a roll", but feels, with their own Six Nations title hopes in tatters and a World Cup in Japan fast approaching, Scotland have to start picking up momentum themselves. "These next two games against Wales and England are against top quality opposition," said the Glasgow Warriors half-back. "Going into a World Cup you want to have scalps from these kind of countries. It shows the world where we're at as a nation. "Momentum is a massive thing. There's a big break after this tournament but then you come back into World Cup camp. If there's a bit of momentum, a bit of confidence behind us after finishing the Six Nations strongly going into the biggest tournament that comes around every four years, it would be massive. "With two good results we can still finish pretty high up the table, so that's our aim."